Dodd, who also ran a livery station, also offered round trip ‘omnibus’ mule-drawn bus service from Honolulu to Waikīkī, which included the use of the Long Branch. Another attraction was a 200-foot long marine toboggan, where “for a nickel, riders could climb a ladder to the top of the run, mount a ‘star oval board’, zip down the chute and ricochet across the water …, skipping along like a flat pebble.” This toboggan was built on the west side of the bathhouse in 1889 by Jim Sherwood, a later owner of the Long Branch Bathhouse. The first hotels in Waikīkī were bathhouses, such as the Long Branch Baths, began to offer rooms for overnight stays in the 1880s. The first beachside hotel, the Park Beach, was a converted home which offered 10 rooms, each equipped with a bath and telephone. 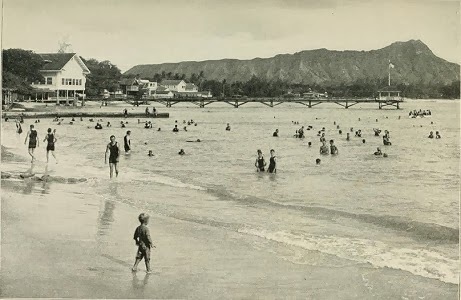 The image shows folks at Waikīkī sea bathing in 1923 (Gerould.) In addition, I have added some other images in a folder of like name in the Photos section on my Facebook and Google+ pages.